18+. New customers from Sweden only. Wagering requirement of 50x bonus amount applies. Bonus expires within 14 days unless wagering requirement is met. T&Cs apply. Experience something new and exciting with Cherry Casino, which was awarded with the title of Best Online Operator 2014 by IGA. A dedication to high quality, players remain committed to the casino where they are known to scoop huge prizes. It is also accessible on mobile devices so you don’t have to be glued to your desktop to enjoy your favorite games. There are more than 400 slot titles to choose from and each game offers something different both in terms of gaming and the rewards that you stand to make. Any sort of games that you are after will be featured on the site. Slots, table games: You can play Blackjack, Roulette, many kinds of poker and other games. Players can try the great titles while on the go. As soon you register, you stand to be rewarded with a welcome bonus of 200 Free Spins. Simply deposit €20 and win prizes up to 200 Free Spins. There are also plenty of monthly and seasonal promotional deals to take advantage of! 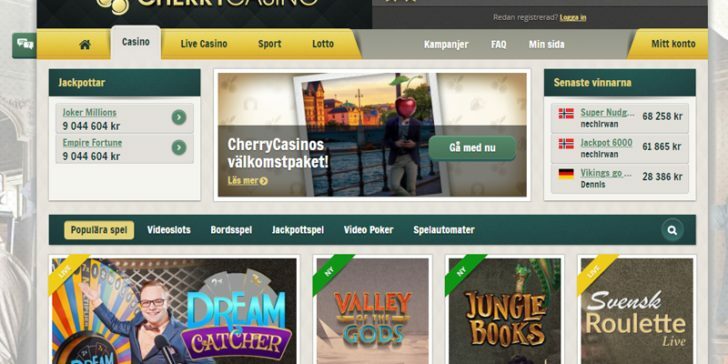 Swedish players get to chose at Cherry Casino. For Swedish players, the 1st deposit bonus is 100% SEK3000. You can also choose the bonus deposit SEK100, play with SEK500. Meanwhile, German and Swiss players can collect a 4-level welcome package of €500 or 250 free spins. After the first deposit bonus, each level comes with two options: a match bonus or free spins. 100% up to SEK3000 Play! Free Spins for New Players at Cherry Casino Play! Christmas Promotion 2017: Cherry Casino Gives Away €500,000! Play! Win a Trip to Fiji 2018 Thanks to Cherry Casino Play! It’s Your Last Chance to Win a Trip to Iceland! Play! Earn Risk Free Lottery Tickets with Cherry Casino! Play! Daily Free Spins for Swedish Players at Cherry Casino Play! Unlock 40 Cherry Casino Free Spins on Weekdays Play! 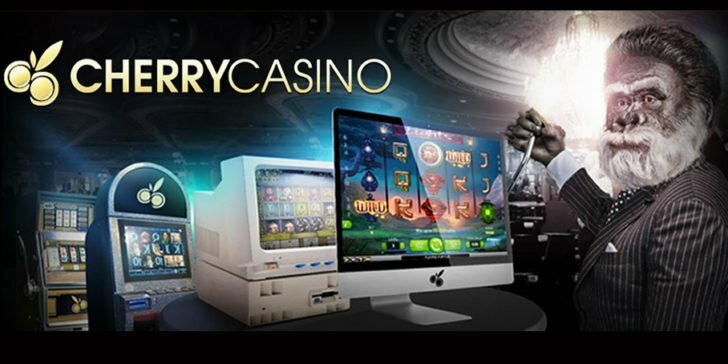 Collect Daily Low Deposit Free Spins at Cherry Casino Play! New No Deposit Bonus for German Players at Cherry Casino Play! Play the New Wolf Club Slot and Win on Cherry Casino’s Prize Draw Play! Climb the Online Slots Leaderboard at Cherry Casino Play! 20 Free Spins for Cherry Casino’s No Deposit New Player Bonus Play! Win €2,000 Thanks to the Cherry Casino Christmas Promotion Play! Claim up to 300 Free Spins Bonus at Cherry Casino Play! Win Huge Raffle Rewards With Cherry Casino’s Festive Covert Mission Play! Earn Free Cash Prizes With Cherry Casino’s Christmas Kick-Off! Play! Win Las Vegas Holiday Packages at Cherry Casino Play! Win a Vegas Trip at Cherry Casino! Play! Get 20 Free Spins No Deposit Bonus at the New Cherry Casino! Play! 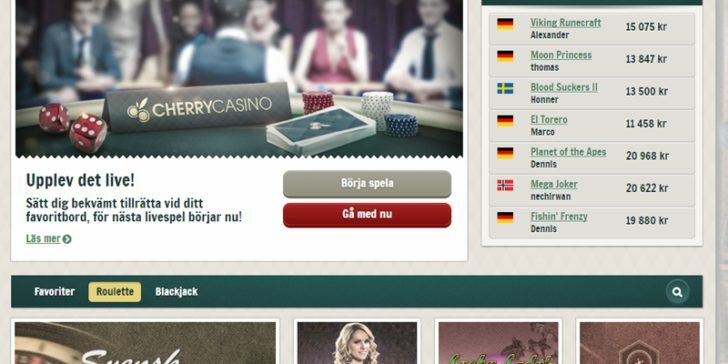 Få 100 gratisspinn bonus uten innskudd hos Cherry Casino! (NOR) Play! Få 100 free spins bonus utan insättning på Cherry Casino! (SWE) Play! 40 ilmaiskierrosta kaikille uusille pelaajille Cherry Casino! (FIN) Play! 40 Freispiele Bonus ohne Einzahlung für neue Spieler im Cherry Casino! (GER) Play! Take this Sherlock Holmes Slot Tournament and win €2,500 at Cherry Casino! Play! Cherry Has a Brand New 175 Freespins Plus SEK 6,000 Svensk Casino Bonus Välkomstpaket for New Players (SWE) Play! Earn up to €260 cash bonus this Christmas Play! New Welcome Bonus for Norwegian Players up to NOK 6,000 at Cherry Casino Play! Win up to EUR 600 with New Cherry Casino German Welcome Packages Play! Enjoy Great Prizes Thanks to the Movie Night Promotion at Cherry Casino Play! It Could Be You: Bonus Money Plus Free Spins at Cherry Casino Play! Cherry Casino Offers their Players Great Bonuses plus the Brutal Truth Play! Cherry Casino Has Superb Bonus Offers Play! Enjoy a SEK 6,000 Welcome at Cherry Casino Play! Get a 100% First Deposit Bonus up to EUR 200 at Cherry Casino Play! Win 3 Month Subscription for Spotify at Cherry Casino Play! Win 996 Free Spins Among Other Great Rewards at Cherry Casino Play! Cherry Casino Cheers You Up With A Chance To Win With The LuckOmatic Play! It’s Your Last Chance to Win a Trip to Iceland!